One of the nine Parisotto built in 1952 for Scuderia Patavium Team, raced at the 1952 Mille Miglia. Often first in class that year at the main hillclimbs. Mr. Alessandro Parisotto was surnamed in dialectal Italian “fasso tutto mi”, that is something like “do anything by myself”! However, despite this statement, following the short story of Parisotto cars, we can discover several people involved in the creation of this little sport. The Scuderia Patavium in Padova in 1949 decided to build its own racing cars using their ingenuity and enthusiasm, as other racing teams did in the (WWII) postwar years. The members-racers found first the collaboration of Armando Pasqualin, a reknown mechanic of the zone building little sports. Lots of parts came, as usual, from Fiat Topolino’s basis but, soon, the whole thing grew up: Pasqualin used different engines and in 1951 developed a light tubular chassis (only 18kg) to replace the Fiat one. Alessandro Parisotto, one of the Scuderia Patavium team founders, in 1952 built his cars around this chassis while, for unclear reasons and disagreements, the relations between Pasqualin and the team itself were interrupted. Nine cars have been assembled in the Cesare Rizzato workshop in Padova. Eight were destined for the racing-members and they were meant to compete in the under 750cc classes, so they had different engines, all with this displacement. They were mostly Fiat units, in the Giannini (at least one) or Siata versions, while one car had a Lancia Ardea unit brought to 708cc, coming from the Ardor one-off built by Ing. Dell’Orto. From the ideas of Enrico Dell’Orto came also the peculiar suspensions for all the Parisotto cars: rubber elastic elements instead of usual leafsprings, years before the Issigonis’s Mini. It is believed that only three of them have been raced. The 9th car was, somehow, a spare car, stiffer and with a 1100cc engine, named “Morassuti”.The most competitive driver in Scuderia Patavium was Gino D’Angeli, racing in several competitions in 1952. The Parisotto cars disappeared from the racing scenes around 1954. 1952 Parisotto-Fiat 750 Sport Siata, chassis 5062652 is one of the 9 barchettas built. It has a Fiat 500B derivated 738 cc engine with the Siata B type head. Registered to Alessandro Parisotto himself, it has been raced under the Scuderia Patavium aegis by Gino D’Angeli. 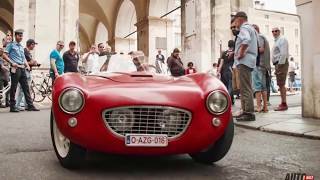 With him at the wheel, assisted by co-driver Alberto Gasparin, the car ran the 1952 Mille Miglia with starting number 2400. Unfortunately the car did not finish the race. The race career of this Parisotto was quite short but really intense and successful: in 1952 chassis 5062652 was often 1st in class, mainly in hillclimbs.